← What would it mean for a machine to suffer? Apropos to the previous post, albeit from a different angle. Click through for full sized version and red button caption. I’ve noted many times before that emotions and other instinctual urges are basically human and animal programming. The idea that robots would be designed to experience emotions, just for the sake of having them is, of course, what many humans intuitively think is the reality for us. 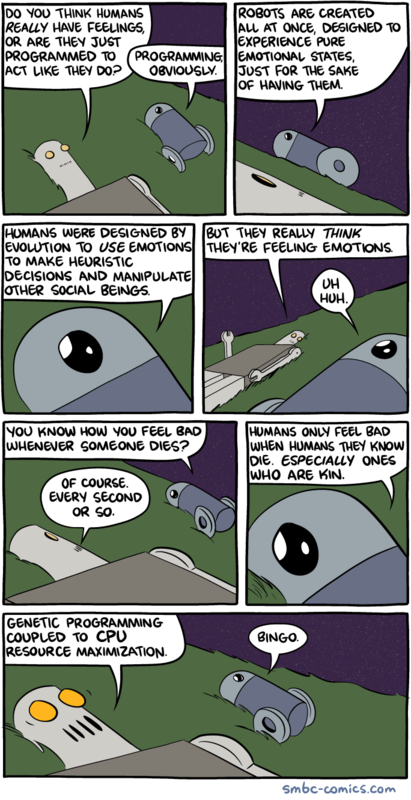 This entry was posted in Zeitgeist and tagged AI, Artificial intelligence, evolutionary psychology, Mind, Philosophy of Mind, robots, Web comic, Zach Weiner. Bookmark the permalink.